Home > Timing Belts MXL-XL-L-H... > XL Timing Belts. Trapezoidal Tooth Gear belts - 0.200" Pitch > 102XL031 Timing belt H/HTD. 102XL031 HTD Timing Belt. Industrial Grade. 10.2” Length. 51 teeth. 5/16” (8mm) wide. 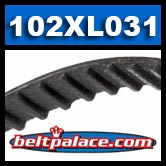 Neoprene (black rubber) replacement “102-XL Series” industry standard Timing Belt. Popular replacement belt for electronic equipment and power tools such as power sanders, woodworking tools & lathes, pumps, and robotic equipment. Belt for Harbor Frieght (Chicago Electric) power tools. Select Models. See number on belt before ordering. Chicago electric 3x21 inch belt sander. Item 69860. Toothed Gear Belts marked “102XL” at 5/16” Width.